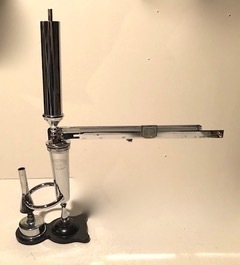 Tony Pearson has generously provided this thumbnail sketch of methods that he uses to produced his sherry wine that in the past several years has garnered medals (including gold) in both the Provincial and Amateur Winemakers of Canada competitions. He describes sherry style wine production in your home cellar is a never ending project resulting in numerous interesting challenges. However, the results are satisfactory bearing in mind the many variables one has to consider and deal with. .
(Slight variations to these specifications were unnoticeable when taking into account all of the variables). Tony exclusively use Palomino grapes, as it is the most popular grape for sherry production. Other varieties when Palomino grapes are not available include Thompson Seedless, Verdelet, Madeline Angevine and Chenin Blanc. Whatever the variety, they should be as ripe as possible. The grapes are crushed and a sherry yeast or an alcohol tolerant equivalent yeast such as Lalvin EC-1118 is added to the must with other recommended additives for a complete fermentation in a warm environment (20 ° C+). When the must is actively fermenting in the primary fermenter gypsum is added at the rate of 2.5 g/l. This is a very important additive as it substantially reduces the pH. The wine is racked into the secondary fermenter, using a cotton ball or smoothing equivalent (lock without water) to obtain a partial oxidation and creating the desired sherry aroma. This procedure will not create a spoiled wine as referred to by some winemakers. When the fermentation is complete, the acid, sugar, pH and alcohol measurements are taken. Assuming acid, sugar and pH measurements meet the finished criteria, the alcohol content is critical. For a fino style sherry, it should be 15.5%. To date, Tony has not been able to have a flor develop, so the alternative was to produce an olorosa style sherry adjusting the alcohol to a minimum of 17%. In order to speed up the sherry making process Tony uses an estufa to increase the temperature of the wine (95-100°C) for an extended period. His estufa is simply a small heated enclosure 18” X 18” X 20” with a capacity to hold 4 imperial gallon jugs. This baking procedure closely resembles the extreme heat; the sherry in Spain is exposed to. It is thermostatically controlled using a 50 watt element housed in an asbestos lined insulated metal clad outer shell con-tainer, to eliminate the danger of a fire. The wine remains in this heated envi-ronment for several months. During this time, it is checked for oxidation, and how the sherry aroma is developing. Within a few months, the wine has cleared and the amber colour associated with some Sherries is evident. After about four+ months, the wine is ready to be racked and used to top up Barrel #1 as required. The next step is the barrel aging process using a configuration referred to as a Solera consisting of anywhere from 4 – 10 barrels. This step increases the flavour intensity, aroma, acidity and alcohol content. 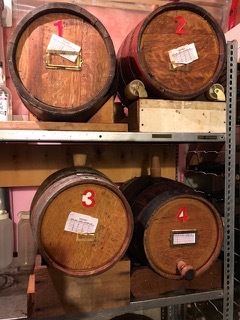 Tony uses four 23 litre barrels numbered one to four. The newest wine is in #1 and the oldest wine in #4. Each barrel is kept 5/6 full, lightly stoppered with a wooden bung. The barrels are a mixture of French and American oak. American oak is considered superior as the staves are more porous. 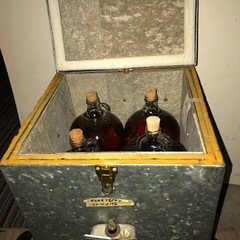 Some wine is taken from barrel #4 after four and eight months and stored in gallon jugs labeled #4a & #8a for final blending remembering to keep the solara topped up to 5/6 full after this wine is removed. These containers effectively add two additional wines to the solara. The proof is in the final blend. During the blending and bottling process samples of wine are taken from each of the four barrels and two jugs, and the final results are based on optimal characteristics of a sherry. Concentration is directed to nose, flavour and alcohol. Tony uses an Ebulliometer to measure alcohol content and adjusts the alcohol content to19+/-% using any 90 or 180 proof alcohol, ie. inexpensive vodka or brandy or commercial alcohol. If using a white alcohol it should be completed neutral, no aroma or smell to affect the nose of the sherry. After blending and alcohol adjustment allow the blend to sit for at least one month for flavours and the alcohol to fully meld. Once a year sherry is bottled as a dry wine without sulphite in 375 bottles. Sherry has an extended shelf life when compared to other wines. Enjoy!